Griffin, with his astronomical $16.15 million 2016 salary, almost certainly will be released prior to March 9, when his salary becomes fully guaranteed. Kaepernick’s salary is $11.9 million on an embarrassingly team-friendly contract that can be voided with little penalty before April 1. Or, rather, it could have been. Kaepernick’s current injury situation presents complications here (more on that later). At face value, the idea of acquiring Griffin or Kaepernick seems enticing. Both are young, big-name quarterbacks with prior NFL success. But experienced quarterbacks don’t become available unless they’re flawed. And given these flaws, I believe it’s likely they’ll be out of the league before either wins another 10 games. First off, let’s ask why he is requesting a trade. The fresh start he needs seemingly found him when the Niners hired head coach Chip Kelly, whose system is built for a mobile quarterback. But it’s also a system built on quick decision-making, which is far from Kaepernick’s forte. Kaepernick is slow to process coverages (when he processes them at all) and doesn’t have a great feel for moving around in the pocket. Kaepernick can be hard to catch when he runs around, but too many of his run-around plays are fruitless because they never should have been run-around plays to start. Staying patient in a crowded pocket has never been a strength for Colin Kaepernick. Too often Kaepernick will look to abandon the pocket the instant he reaches the top of his dropback. Coaches hate this because it nullifies the play’s route designs. It can also create pressure where none existed. If you’re breaking down and moving at the top of your drop, the primary place to move is up in a pocket that hasn’t fully formed, putting you closer to interior pass rushers and compromising the room you have for stepping into throws. Or, you can move laterally, out of the pocket, which puts defensive ends in play. Remember, offensive tackles can’t see the quarterback; they’re blocking under the assumption that he’ll be in the pocket. When the quarterback flees, his technique and his blockers’ techniques are likely to break down. Also, the throwing windows and angles are altered, which often leads to minus results. If a nearly four-year starting quarterback can’t be trusted to even attempt—let alone complete—something like a fullback flare on the game’s first play, then he can’t be trusted. You can’t construct, let alone perfect, a passing attack with such instability. All of these flaws speak to an ill understanding of basic progression reads and coverage diagnostics, as well. Because if Kaepernick consistently knew what he was looking at on his dropbacks, there’s no way his pocket poise and decision-making would be so erratic. Adding to this: when Kaepernick does play with patience, he has a tendency to be late with the ball or to flat-out leave open receivers untargeted. Given their flaws, I believe it’s likely both Griffin and Kaepernick will be out of the league before either wins another 10 games. Could Kelly adjust to accommodate Kaepernick? Perhaps. But that runs counter to the way Kelly historically has done business. Besides, Kelly could argue that his approach makes a QB an inherently quicker decision-maker. By getting to the line and snapping the ball so promptly, Kelly’s offense hinders an opponent’s ability to disguise coverages. The defense barely has time to get set. This creates predictable looks, aiding a quarterback’s sense of passing anticipation. 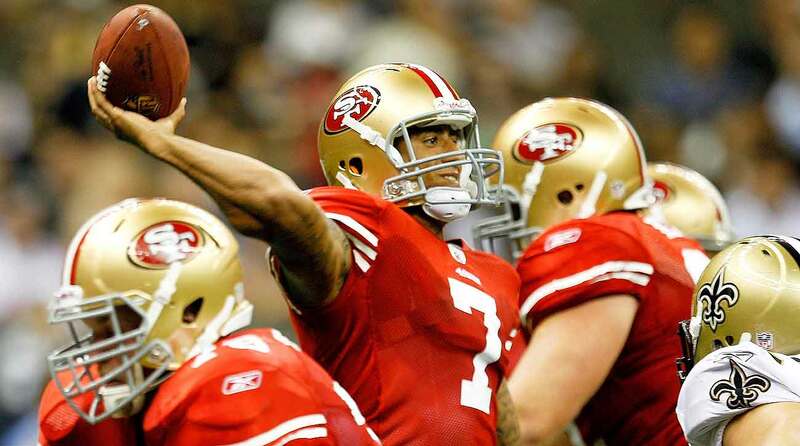 However, Part B of Kaepernick’s issues is that he has an elongated throwing motion. This isn’t necessarily the worst thing. After all, no one can argue that as a pure arm talent, Kaepernick, when he’s mechanically sound and decisive (which is not often enough), is as impressive as almost anyone in the league. But elongated motions jibe with slower-developing downfield plays, not with the quick-hitting, snap decision-making that Kelly’s scheme demands. The Niners brass presumably does not believe the advantage from Kelly’s unique approach can offset Kaepernick’s weaknesses. Because why else would Kaepernick be asking for a trade? Unless his advisors are complete morons, Kaepernick’s only rationale for wanting out of the rare offense that caters to his mobility is if he believes he won’t be the one running that offense come September. Kaepernick’s camp is reading San Francisco’s writing on the wall. Complicating matters is that Kaepernick is still recovering from surgeries on his shoulder, knee and thumb. What makes his contract team-friendly is that it can be voided without penalty any time before April 1. That is, unless he’s not healthy. Presumably, the Niners would love for doctors to clear Kaepernick now, putting the option of cutting him back on the table. And Kaepernick, presumably, would love to stay on the mend until after April 1, making his 2016 salary guaranteed. But remember, the Niners most likely believe Kaepernick cannot be The Guy. Which means if he is on the roster in 2016, he could very well get the treatment that Washington gave RG3 in 2015. Once he was in Kirk Cousins’s rearview mirror, Griffin became nothing more than a liability. Had he suffered an injury that carried into this offseason, the NFL’s fifth-year option rule would have made his $16.15 million salary in ’16 fully guaranteed. So, Washington, playing it safe and smart, kept Griffin off the active roster. Kaepernick’s shoulder injury could ultimately keep him—and his $15.9 million cap number—on the books in 2016. Rather than risk swallowing that bitter pill again in 2017, the Niners could entrench Kaepernick on the bench and out of harm’s way. Let’s keep some perspective here: if Griffin were a decent player, he would not have been ostracized in ’15. Griffin’s weakness showed up glaringly after he returned from his knee injury in 2013 and worsened as defenses saw more of him. Headlining Griffin’s problems was that he had little to no pocket refinement (among other issues). It’s not enough to simply make throws from the pocket. In fact, in an offense as well-designed and as heavily predicated on play-action as Washington’s, throws from the pocket can be routine because so many of the reads are clearly defined. But straightforward passing designs and play-action tend to happen on first or second down, when the threat of a run is still there and the defense is in a vanilla coverage. Most NFL games, however, are decided by what happens on third down. 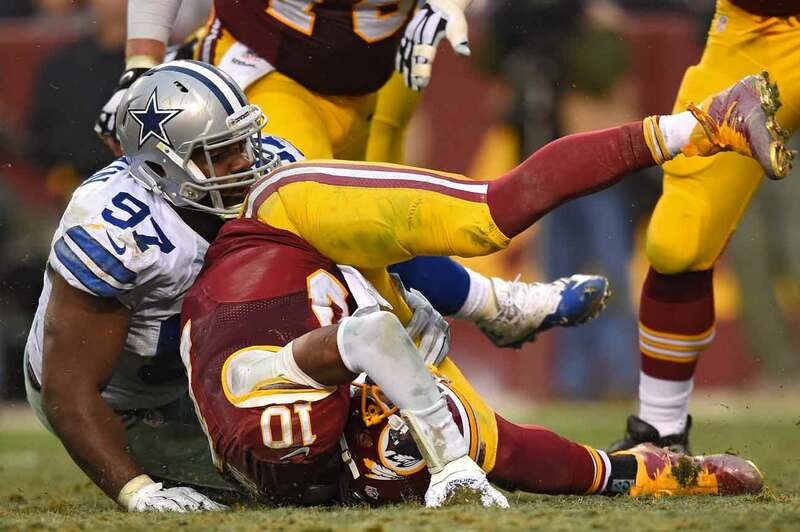 Robert Griffin III’s slight frame hasn't been able to stand up to the hits he's taken when straying outside the pocket. It’s here where Griffin’s shortcomings really show up. Too often when he moves in the pocket, he covers too much ground, compromising his readiness to throw. This also hurts the pass protection, as the exaggerated movement can put him closer to pass rushers who wouldn’t have been factors. And it lengthens the time it takes to wind up and release the ball. Adding to Griffin’s physical lack of pocket subtlety and nuance is his limited comprehension of how routes relate to certain coverages. Time and again in 2014, Griffin failed to identify some of football’s most basic route combinations. There were even cases of his defined reads—that is, plays that present just one obvious place for the ball to go—being ignored. Head coach Jay Gruden or offensive coordinator Sean McVay would call a pass and have no idea whether it would be executed correctly. Worse, neither would the receivers. How can you coach a dangerous but frankly emotionally unpredictable guy like DeSean Jackson if he’s getting open but not seeing the ball? Tying into all of this was a lack of anticipation in Griffin’s passing. In the NFL, you don’t necessarily have to sense receivers being open before they are, but it makes a world of difference if you can. And, naturally, there are a handful of routine plays each game that call for a little bit of anticipation. But Griffin, with his limited understanding of coverage-and-route relationships, never had an opportunity to develop any anticipation. And if you can’t develop it on your own, you can’t develop it at all. Most coaches agree: anticipation is one of the few quarterbacking traits that cannot be taught. Exacerbating matters for Griffin is that Gruden shied away from the zone-read game that had bolstered him as a rookie. Gruden felt the 6-foot-2, 223-pounder could not endure much beating. Defenses had always been extra physical against Griffin because he had no feel for protecting himself. Most the hits he took had a double-dip return: one from the hit itself, the other from when his body splattered to the ground. Griffin doesn’t have Cam Newton’s size or Russell Wilson’s compactness. He’s a gangly, exposed runner. This realization was the coup de grace to his NFL career. In talking casually with dozens of coaches throughout combine week, there were two camps of ideology on Griffin and Kaepernick: in one camp were those who don’t think they can play in the NFL (more coaches felt this way about Griffin than Kaepernick); in the other were those who think they can play but don’t know in which system. Of course, it only takes one team’s final decision-maker to roll the dice. Which is why we probably won’t see the last of either QB in 2016. 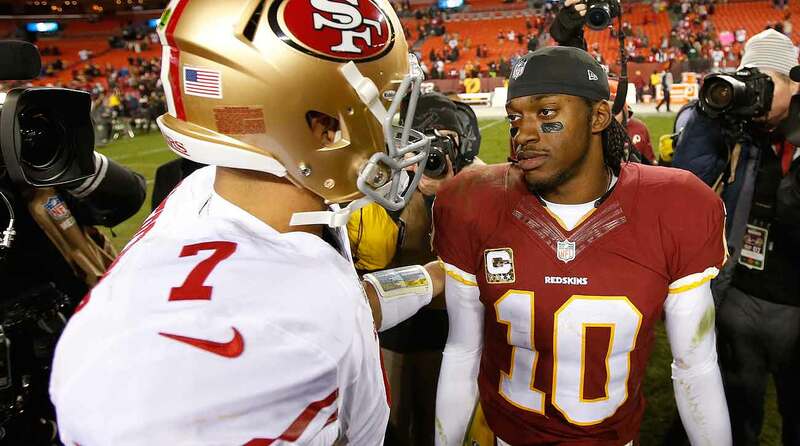 But as far as RG3 or Kaepernick being a team’s clear-cut starting quarterback? We’ve absolutely seen the last of that.